US President Obama laid a wreath at the Hiroshima Peace Memorial on Friday, telling an audience that included survivors of America’s atomic bombing in 1945 that technology as devastating as nuclear arms demands a “moral revolution.”Thousands of Japanese lined the route of the presidential motorcade to the memorial in the hopes of glimpsing Mr. Obama, the first sitting American president to visit the most potent symbol of the dawning of the nuclear age. “Seventy-one years ago, on a bright cloudless morning, death fell from the sky and the world was changed,” Mr. Obama said in opening his speech at the memorial. Obama was not expected to apologize for the U.S. action to hasten the end of World War II and he did not during his 20-minute-long remarks.In the Hiroshima museum's guest book before his speech, the President wrote that he hoped the world will "find the courage, together, to spread peace, and pursue a world without nuclear weapons.‎"During the speech, the park was silent except for a circling helicopter, chirping birds and camera shutters.Obama said there is a "shared responsibility" to look into the "eye of history" and ask what must be done to prevent another nuclear weapon being used.He urged that the world make moral progress alongside its remarkable scientific advancements. 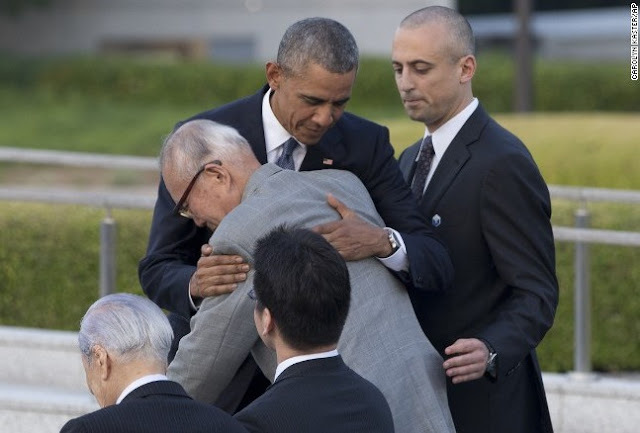 During his visit, President Barack Obama hugged Shigeaki Mori, an atomic bomb survivor who created the memorial for American WWII POWs killed at Hiroshima. Mr Obama spoke to two survivors and in an address called on nations to pursue a world without nuclear weapons.At least 140,000 people died in Hiroshima and another 74,000 three days later in a second bombing in Nagasaki.Mr Obama first visited the Hiroshima Peace Memorial Museum before walking to the Peace Memorial Park, accompanied by Prime Minister Shinzo Abe.Both men stood in front of the eternal flame. Mr Obama laid a wreath first, followed by Mr Abe. Back home, Economic Times reports issuance of a liability policy – a significant one at that – the First Nuclear Liability Policy aimed to push private investment. The report states that the country's first Nuclear Operator's Liability Policy has been issued to Nuclear Power Corporation of India , underwritten by a consortium of insurance companies through the India Nuclear Insurance Pool. The policy was the missing component from the set of requirements for getting private investment in nuclear power - the doors for which were opened ten years ago when the then Manmohan Singh - led government signed the civil nuclear agreement with the US. The report adds that the entireRs 1,500-crore India Nuclear Insurance Pool is entirely supported by domestic companies and is managed by General Insurance Corporation ( GIC ), which has also committed funds to the pool. The first policy was issued by New India Assurance - the largest state-owned company. Chairperson, GIC, is quoted as saying "In all history, there have been only three nuclear accidents - Three Mile Island (US), Chernobyl (now Ukraine) and Fukushima (Japan) and the probability of another is remote. Though the nuclear deal ended India's isolation, investment was not forthcoming. This was because nuclear risks are generally excluded by insurers and nuclear power operators have a maximum liability of Rs 1,500 crore under the new law.